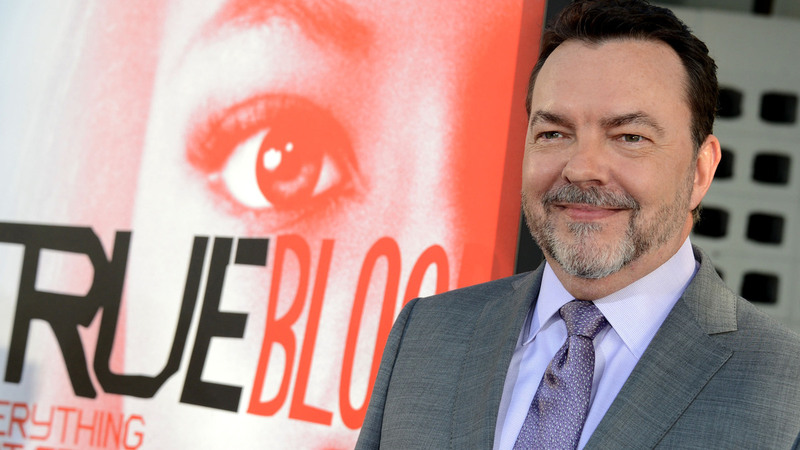 Alan Ball On Leaving 'True Blood' Behind Writer/producer Alan Ball is leaving True Blood, the highly successful HBO show he created, at the end of its fifth season. He talks about the show, his childhood and coming out to his mother. Writer Alan Ball arrives at the premiere of the fifth season of HBO's True Blood in May. Ball is leaving the series at the end of this season. Nothing panics the fans of a show quite like the departure of the creator. That's just what's happening at True Blood, where creator Alan Ball is leaving after five seasons, but the show goes on. As he tells Laura Sullivan on weekends on All Things Considered, he feels some nostalgia, but he's ready. "I feel like the show is in very good hands, and I look forward to watching it next year. I just look forward to not working as hard. I've been a workaholic for a long time, and I'm sort of looking at that and addressing that and seeing what exactly was behind that that wasn't healthy and maybe trying to just sort of open up some space in my life a little bit." One thing fans might miss is what Ball acknowledges are periodic nods to politics or religion — Sullivan mentions a sign hanging on a church reading, "God Hates Fangs." Ball says it's certainly the case that there could be parallels between the unwelcomeness of the vampires and the unwelcomeness that gays and lesbians still feel at times. But Ball says it's not really about arguing politics. Eric Northman (Alexander Skarsgard) and Sookie Stackhouse (Anna Paquin). "For me, that's mostly just window-dressing that makes it contemporary," he says. "I feel like if the show was 50 years ago, it would be civil rights; if it was 100 years ago, it would be women's rights." What does he think the show is about? He says True Blood is ultimately about "how we deal with our primal desires. How do those elements of our psyche manifest themselves in a world where monsters were real?" That's not to say sexuality of all kinds isn't a real part of the show. While Ball says he feels no obligation to include gay people in every show just because he's gay himself, he says that in this case, it makes sense. "In a Southern Gothic world, you're going to have some gay men and women. You know, just because that just feels organic." For Ball himself, growing up gay in the South — in Marietta, Ga., specifically — had its difficult moments. "I will say that the environment I grew up in was not the most progressive." Even coming out to his own mother wasn't a simple thing. He didn't tell her until he was 33, though he'd realized he was gay in his early 20s. And what did she do? As he describes it, she "grabbed her head like it was going to fly off her body." And what did she say, specifically? " 'Oh, God has dealt me some blows in this life. Please don't tell anybody in my family until I'm dead, which won't be much longer now.' " He pauses. "I started laughing at that point, because it was like, 'All right, that's farce.'" But things got better. "I've got to give her credit," he says. "She was born in 1913, and it's difficult for somebody born in 1913 to, I think, immediately embrace their child. It may not have been immediate, but she definitely did embrace me." He goes on to say, "Telling her was the single best, most positive step I took toward mental and emotional well-being, and I've never regretted it."